It was on 27 May 1911 that Vincent Price was born in St. Louis, Missouri. He was born to a life of wealth. His grandfather, Vincent Clarence Price, had invented Dr. Price's Baking Powder, the very first cream of tartar baking powder. His father, Vincent Price Sr., was president of the National Candy Company, which produced everything from jawbreakers to jelly beans. While Vincent Leonard Price Jr. was born to wealth, however, his fortunes would lie beyond baking powder and candy. Instead, he would become one of the most famous actors of all time, and one of the most influential as well. Most of the impact Vincent Price had would be upon the horror genre. Indeed, it is safe to say that he is one of the five best known horror actors of all time, alongside Boris Karloff, Bela Lugosi, Peter Cushing (whose birthday falls a day before Mr. Price's), and Sir Christopher Lee (who shares his birthday with Mr. Price). When it came to horror movies Vincent Price occupied a position he shared with Peter Cushing. Unlike Messrs. Karloff, Lugosi, and Lee, Messrs. Price and Cushing rarely if ever played monsters. Instead they played mortal men, who were either bent on revenge, created monsters, or fought monsters. Indeed, it was not unusual for either Peter Cushing or Vincent Price to play the hero in their films. What set Vincent Price apart from Peter Cushing is that often Mr. Cushing had to share billing with Sir Christopher Lee, while Vincent Price was almost always the star of his movies. It is perhaps because of this that Vincent Price would have a lasting impact on horror movies. Indeed, it can be argued that Mr. Price was partly responsible for the shift back to Gothic horror away from science fiction horror in the late Fifties. Even before Hammer Films released their classic Curse of Frankenstein (1957), Vincent Price had starred in such Gothic horror movies as House of Wax (1953) and The Mad Magician (1954). After Hammer Films had released Curse of Frankenstein, Vincent Price would appear in even more Gothic horror pictures, including the original House on Haunted Hill (1958) and House of Usher (1960). While there can be no doubt that much of the shift back to Gothic horror movies in the late Fifties was due to Hammer Films, much of the responsibility rests with Vincent Price as well. If Vincent Price had a lasting impact on horror movies in general, it is perhaps because he made several individual films that would prove highly influential. House of Wax was the first colour movie in 3D to be released by a major studio, preceded only by Bwana Devil (1952--it was an independent production) and Man in the Dark (1953--it was shot in black and white). The success of House of Wax would fuel the fad for 3D movies which lasted for the next 2 1/2 years. The success of Roger Corman's House of Usher (1960) would not only lead American International Pictures to produce more adaptations of Edgar Allan Poe stories. Two of Mr. Price's later films, The Abominable Dr. Phibes (1971) and Theatre of Blood (1973), could possibly have been two sources of inspiration for the similarly themed Saw (2003). Although it might be a dubious honour at best, The Abominable Dr. Phibes and Theatre of Blood may be partly responsible for the cycle of torture chic movies in the Naughts. The lasting impact which Vincent Price's films had on pop culture in general can be seen in the many references to them. This is particularly true of The Fly (1958), which has been referenced in everything from The Simpsons too the movie Matinee (1993). Similarly, House of Wax has also been referenced in pop culture often, in everything from the sitcom Get Smart to the movie Monsters vs. Aliens (2009). These movies are hardly the exception to the rule, as a large number of Mr. Price's films, from The Invisible Man Returns (1940) to The Abominable Dr. Phibes, are referenced in pop culture with an alarming regularity. In later years Vincent Price's position as one of the foremost actors in the horror genre would lead him to being involved in horror oriented projects. On Alice Cooper's concept album Welcome to My Nightmare, Vincent Price provided narration for the song "The Black Widow." Later he would provide narration for the Michael Jackson song "Thriller" from the album of the same name. He would host the BBC Radio programme The Price of Fear and for a time the American radio Tales of the Unexplained. Vincent Price would also provide the narration for Tim Burton's classic short film and tribute to him, "Vincent." From 1981 to 1989 he was the host of the PBS show Mystery! Of course, Vincent Price was much more than a horror actor. As film buffs know, he appeared in a good many films that were not horror movies, from The Private Lives of Elizabeth and Essex (1939) to The Whales of August (1987). From the Thirties into the Fifties Vincent Price frequently appeared on stage in non-horror parts, even playing Abraham Lincoln in Yours, A. Lincoln in 1944. 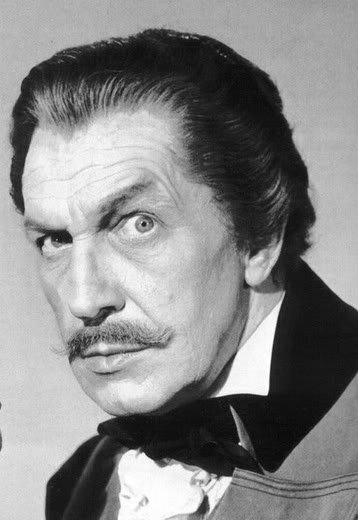 Even in the Sixties and Seventies, when Vincent Price's career in horror movies was at its peak, he would play roles that were not part of the horror genre. He played a prospector in The Jackals (1967) and eccentric game inventor Milton Parker in the comedy Scavenger Hunt (1979). Unlike many of his compatriots in the horror genre, for most of his career Vincent Price was in demand for parts that did not deal with mad scientists, the walking dead, or ghosts. Indeed, Vincent Price's contribution to the world not only went beyond the horror genre, but beyond acting in film, period. Vincent Price had majored in art in college and his love of art continued until his death. He was well known as an art collector, and in 1951 he started donating fine art to East Los Angeles College. By 1957 the Vincent and Mary Price Art Gallery would be founded at the college. It would evolve into the Vincent Price Art Museum, which still exists today. He was also a member of the Cortauld Institute in London, England, dedicated to the study of art history. He was also a gourmet cook who not only authored cookbooks, but hosted a cooking show called Cooking Pricewise. Nowhere would Vincent Price's influence be more acutely felt than his home state of Missouri. While he spent much of his time elsewhere, Mr. Price never forgot the state in which he was born. He started maintaining close ties with Northeast Missouri State University in Kirksville (now Truman State University) late in his life. It was about 1960 that Mr. Price first appeared at NMSU, appearing nearly every year at the university for nearly thirty years. He even taught workshops on both acting and art history at the university. In 1984 Mr. Price founded the Vincent Price Theatrical Performance scholarship at the university, awarded to those who have demonstrated talent in acting. It is because of Vincent Price's contributions to film, acting, art, cooking, and his home state that today there is a Vincentennial--a celebration of the 100th birthday of Vincent Price--being held in St. Louis. Today's celebration is the culmination of a two week celebration, during which his films are being viewed and his daughter Victoria will give a speech. Many other famous actors have been born in St. Louis and still more in the state of Missouri, but perhaps none are as beloved as Vincent Price. In the end it must be concluded that Vincent Price is not only remembered as a great actor, but as a great man. He was scholar, a professional, and a true gentleman. Not only did he show concern for his fellow actors on the screen on the stage, but even for his fans. Living here in Missouri I have friends who had the honour of meeting Mr. Price when he would visit NMSU. In every instance he not only gave my friends autographs, but talked with them as well. A cultured intellectual born to wealth, Mr. Price treated everyone he met as a human being. He may have played many villains in his films, but in reality Vincent Price was man of honour and integrity. If he is remembered today, then, it is not simply because he was a great actor, but a great man, period. I loved a lot of his work but Dr. Phibes was probably my favorite character. Thanks for that, Merc. I only knew the basics, the films, the love of art, etc. This has given me an even deeper appreciation of the man. Well written and interesting post. Wonderful piece. As a kid, I loved seeing Vincent Price as Egghead on the "Batman" TV series and also in horror features Saturday afternoons at the movies. Old movies on TV made me discover how long a career he had. As you wrote, from the late 1930s. A Price role that's a big favorite of mine: The loopy soap company exec in CHAMPAGNE FOR CAESAR with Ronald Colman. Price also had the comedy gift.